If WALL-E and EVE do their jobs, Earth could learn within minutes if InSight lands safely. Engineer Joel Steinkraus uses sunlight to test the solar arrays on one of the Mars Cube One project spacecraft at NASA's Jet Propulsion Laboratory in Pasadena, Calif.
Their mission: Broadcast immediate news, good or bad, of InSight’s plunge through the Martian atmosphere on Monday. Named WALL-E and EVE after the main characters in the 2008 animated movie, the twin CubeSats will pass within a few thousand miles of Mars as the lander attempts its dicey touchdown. 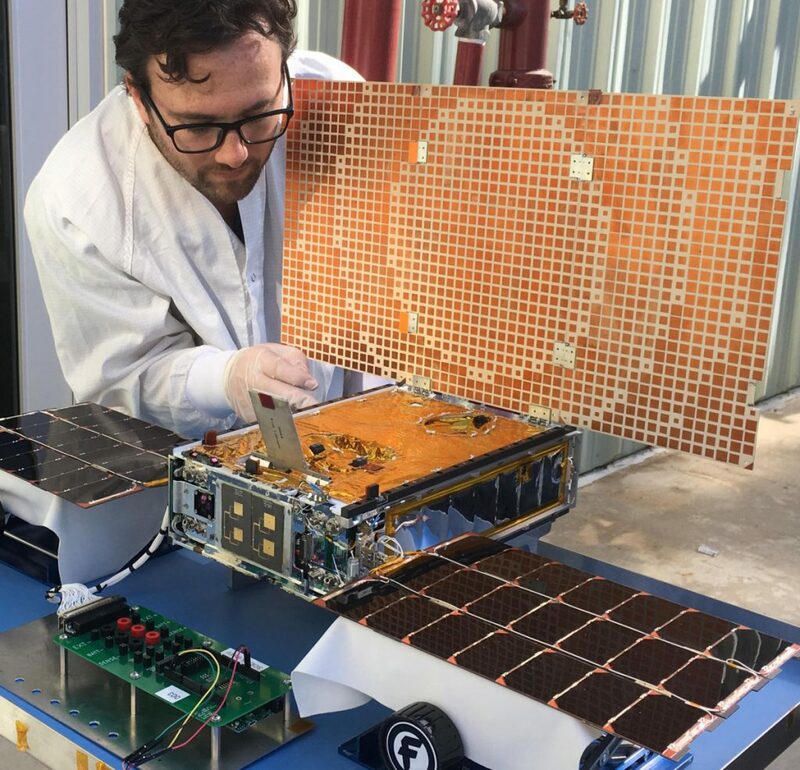 If these pipsqueaks manage to relay InSight’s radio signals to ground controllers nearly 100 million miles away, we’ll know within minutes whether the spacecraft landed safely. WALL-E and EVE, each the size of a briefcase, hitched a ride on the same rocket that launched InSight to Mars in May. CubeSats always share rockets; they’re too small and inexpensive to warrant their own launch. This Mars Cube One project, or MarCO, built and managed by NASA’s Jet Propulsion Laboratory, cost $18.5 million. NASA kept the CubeSats about 6,000 miles away from InSight during the 300 million-mile journey to Mars to prevent any collisions or close calls. The mini satellites were just as far from each other for the same reason. The elbow room in this “very loose formation,” as chief engineer Andy Klesh describes it, has varied during the mission and is narrowing as the spacecraft draws ever closer to Mars. For the record, EVE has behaved better than WALL-E during the 61/2-month voyage to Mars. Each CubeSat has the same type of cold gas propulsion that’s used in fire extinguishers to spray foam. In the film, WALL-E uses a fire extinguisher to propel through space. In reality, WALL-E has been leaking fuel almost since liftoff. Flight controllers have worked around the problem. Meanwhile, “EVE seems to follow her namesake and has been flying beautifully throughout the mission,” said Klesh. In June, WALL-E and EVE aced a series of radio-relay tests using signals from a big dish antenna near Palo Alto, California. Klesh said that gives engineers confidence in the CubeSats’ ability to do the same with InSight’s signals on landing day. Last month, the pair sent back photos of Mars from 8 million miles out. Mars was merely a bright pinpoint, but the team said it marked a proud CubeSat first. It takes eight minutes and seven seconds for a radio signal to get from Mars to Earth, one way. It should take less than a minute on top of that to get word from InSight, if the mini satellites cooperate. That means NASA could know InSight’s fate close to real time. If WALL-E and EVE are mum, confirmation would come directly from the lander or, hours later, from spacecraft circling Mars. As NASA explores new worlds, it would be handy to have listening outposts to beam back descent and landing updates. Spacecraft already in orbit around Mars serve that purpose whenever NASA sends a lander. But where there are no satellites – think asteroids or dwarf planets on the fringes of our solar system – CubeSats could step in, with little overhead and low cost.